As mass printing became more popular across Europe in the 1900’s, two major problems emerged with inks and flat plates for the printing presses. Water based inks at the time often smeared and were not conducive to long term production with un-bendable flat plates. Rubber printing changed the process by using flexible plates for more accurate and faster printing. Another productivity change came when oil based ink began to be used instead of water based. The use of rubber plated printing presses grew in popularity during the early 1920’s when Germany became a huge manufacturer of the machines. The use of rubber printing also became one of the main mass publication forms for the United States. It was in the states that the term “flexography" started to be used instead of rubber, having been put to a popular vote by the Packaging Institute's Printed Packaging Committee in 1951. Changing the name turned out to be a great idea, not only for consumers of package goods, but for the process itself. As printing innovation continued to make things faster and better, the plates themselves would change from basic rubber to other materials more pliable for the process. The plating material switched from plain rubber to a photopolymer due to the ease in which the polymer can be etched and its ability to be attached to a cylinder. A standard photopolymer is able to be grooved by using a light source, the most common form being ultraviolet light. 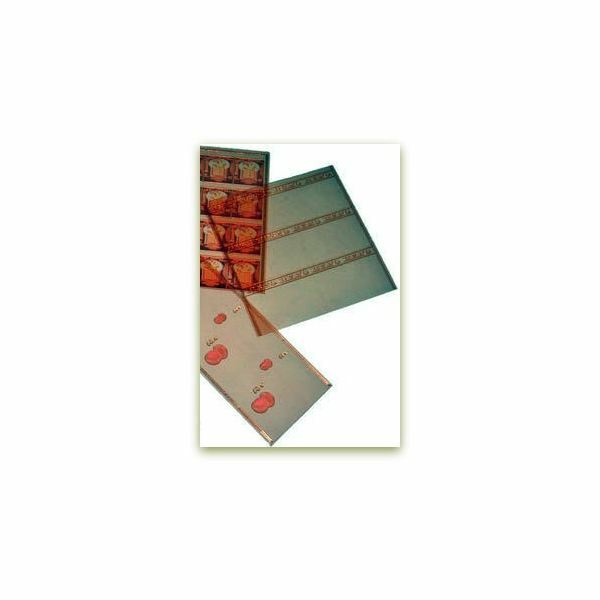 In order to etch a plate, a film negative with the information to be printed is laid on top of the photopolymer. Once the film and plate are lined up they are then both exposed to a light source for a certain amount of time. As the light affects the photopolymer, the substance hardens where the light makes contact effectively etching the film information on to the top layer of the plate. The result from this process is a sturdy plate that can bend to printing cylinders for mass production without breaking easily. Knowing how this plate is made is only one component in learning how flexography printing works as a whole though. The full process of flexography printing is really a combination of two different forms of printing, but with the added bonus of flexible plates. The forms are that of rotogravure and letterpress printing. Rotogravure printing is the etching or carving of information on to a surface, where letterpress printing is just printing by pressing the plate onto another surface. The letterpress used for flexographic printing is not the flat sheet style, but the rotary web; this means that the press is in a cylindrical shape. With the rotogravure form, the process of using the photopolymer plates attached to a cylinder is what transfers the information to a surface. Each form is set in alignment with the other to make up the flexography process. The line up for printing involves five components: ink pan, fountain roll, anilox roll, plate cylinder and impression cylinder. Each one is needed to complete the flexography process. The ink pan, laid out first, is placed on a smooth surface and is a large industrial type bowl filled with ink. Suspended partially in the pan is the fountain roll which transfers the ink in which it is dipped into, and places it onto the anilox roll as each one is rotating. Once the ink is brought up to the anilox roll, the roll is then covered with a certain amount of ink by way of its small dimpled surface. Excess ink is scraped from the roll using a scraping or “doctor" blade. 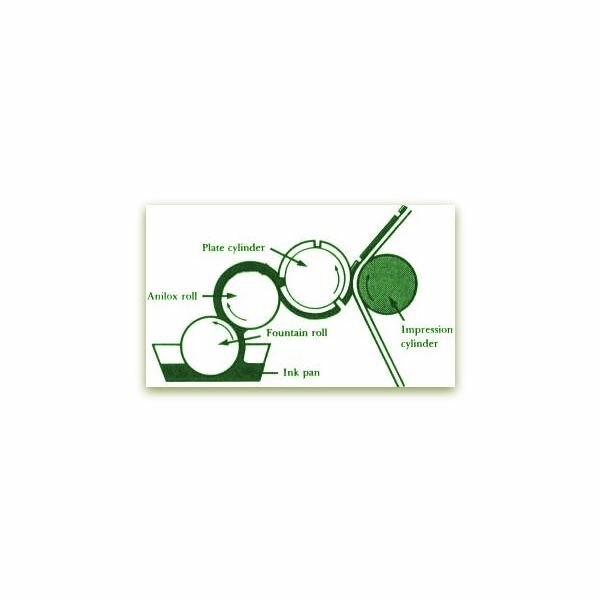 The dimpled surface of the anilox roll is what ensures that the right amount of ink needed for printing is able to transfer to the plate cylinder. The plate cylinder is then rotated to allow for ample ink coverage on the raised areas that will be printing. As the cylinder rotates the impression cylinder is pulling the printing material through to be printed. The type of printing material used can vary depending on the need of what is being printed. For example, in newspaper printing a paper would be attached to the impression roll, but for a packing need there could be cello wrap being pulled through on the roll. It is also important to note that water based inks have come a long way since first being used and there are some now that have a low smearing factor. This means that for this printing process many types of printing ink can be used.